http://www.valroofing.com/wp-content/uploads/2017/05/MetalRoofRed.jpg 816 1088 Valley Roofing http://www.valroofing.com/wp-content/uploads/2013/03/Valley_Roofing_Logo.png Valley Roofing2018-10-31 10:28:552018-10-31 10:29:28Why Metal Roofing Is A Top Design Trend For 2018.
http://www.valroofing.com/wp-content/uploads/2017/05/shingle-residential.jpg 816 1088 Joseph Showalter http://www.valroofing.com/wp-content/uploads/2013/03/Valley_Roofing_Logo.png Joseph Showalter2018-05-21 09:11:012018-01-25 09:14:56Learn About Roofing Materials So You’re Prepared For Your Project. http://www.valroofing.com/wp-content/uploads/2014/01/W8A0852.jpg 3720 5580 Joseph Showalter http://www.valroofing.com/wp-content/uploads/2013/03/Valley_Roofing_Logo.png Joseph Showalter2018-03-21 08:51:542017-07-21 09:00:13A Professional Roof Inspection Is An Important Investment. Establishing Your Yearly Budget: How Much Does A New Roof Cost? How much does a new roof cost? For most homeowners and business owners, a new roof is a significant investment that is made infrequently. The lifetime of your roof can be from ten to 100 years, depending on the material. http://www.valroofing.com/wp-content/uploads/2017/05/shingle-2-story1.jpg 706 942 Alan Martin http://www.valroofing.com/wp-content/uploads/2013/03/Valley_Roofing_Logo.png Alan Martin2018-01-16 08:29:552018-01-22 10:13:46Establishing Your Yearly Budget: How Much Does A New Roof Cost? Get Ready for Winter with A Roof Inspection. A roof inspection in early December ensures your roof is in the condition necessary to withstand the harsh elements of winter. Should your roof need replacement or repair, this early inspection gives Valley Roofing the time to repair or install a new roof before the snow and ice starts accumulating. http://www.valroofing.com/wp-content/uploads/2014/10/Picture-e1530126974395.jpeg 1725 1836 Anson Martin http://www.valroofing.com/wp-content/uploads/2013/03/Valley_Roofing_Logo.png Anson Martin2017-12-21 08:18:472018-06-27 15:16:39Get Ready for Winter with A Roof Inspection. When you considering a metal roof for your home, you’re considering an option that meets almost every roofing expectation of the average customer. You’re choosing an option with character, durability, and beauty. http://www.valroofing.com/wp-content/uploads/2017/05/MetalROOFbw.jpg 816 1088 Anson Martin http://www.valroofing.com/wp-content/uploads/2013/03/Valley_Roofing_Logo.png Anson Martin2017-11-22 12:36:332018-10-11 12:26:03A Metal Roof is Beautifully Durable. Sometimes when you notice a roofing problem, you are in need of a major fix. With early detection, you can save yourself the major headache of a costly, urgent repair. From roof leaks to storm damage, follow these 3 rules to safeguard your roof with an early Harrisonburg roof repair. Flashing on a chimney and metal roof. From both inside the house and outside, take a long look for signs of water or damage to your chimney flashing. Flashing is the protective layer that keeps moisture out of the seams along your roof. Flashing should be visibly secure to the roof, chimneys, and any architectural or functional features that sit on your roof. Loose or peeling flashing may indicate water has begun to penetrate the seam, and your roof may be in jeopardy. Secure flashing is a sign of a healthy roof! Take a look at a before and after flashing job we did here locally. #2: If you live in a townhouse or duplex, notice the condition of your neighbors’ sections of the shared roof. Multiple roof types in one system. While the roof over your home may not show signs of damage, a shared roof may hide concerns. Walk along the perimeter of the multiple homes for visible signs of damage. Look for loose or peeling singles or even missing shingles from the entirety of the roof. If the roof system has multiple types of roofing, look to the right and left of your roof for signs of secure connections. Runoff from neighboring roofs should be routed to a functional gutter system and have a clear path away from your roof. #3: Weigh the cost of waiting or taking early action. Home Advisor reports the national average cost for roof repairs fall between $300 and $1,000, which is significantly less than the cost of a new roof. Should you need a new roof, we offer four convenient payment options to give you maximum flexibility. 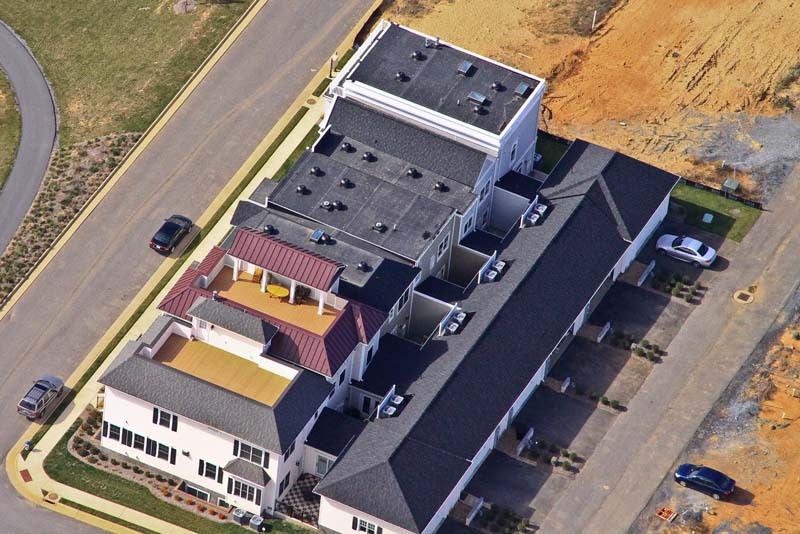 Contact Valley Roofing today to schedule a free roof inspection for Harrisonburg roof repairs!